Artichokes are usually thought of a spring vegetables, but in many countries, including here in the US, they have a second season in the Autumn. 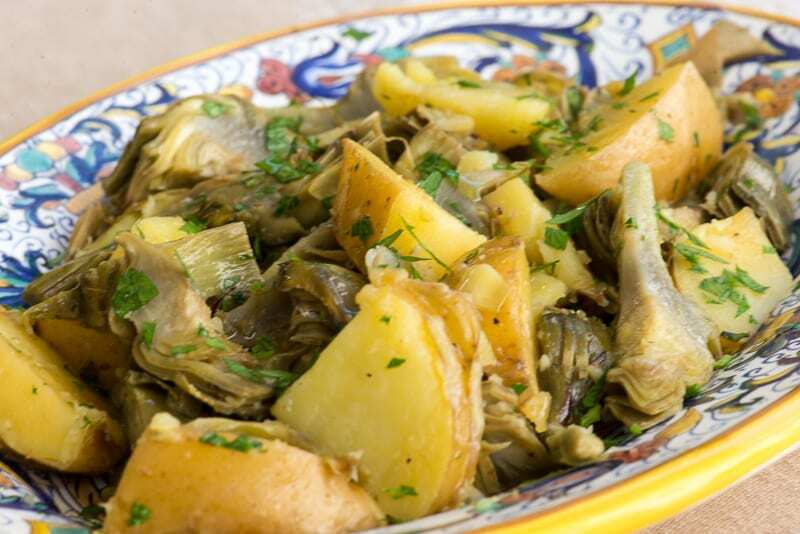 It’s a great time to try Braised Artichokes and Potatoes. The tubers bring the kind of heft you want when the weather turns chilly, and they absorb the flavor of the artichokes beautifully, so that a few of those rather expensive artichokes can feed a crowd. This is not the most photogenic dish in the world—you could even call it ugly—but it makes for a very fine contorno that will go perfectly with just about any meat or fish course. Trim the artichokes and cut them into wedges. Peel the potatoes and cut them, too, into wedges. Ideally, they should be about the same size as the artichoke wedges. Drop the wedges in acidulated water as you work to avoid discoloring. In a braising pan large enough to hold all the ingredients, sauté the garlic cloves in olive oil until just lightly brown and discard. Drain the artichoke and potato wedges, and add them to the braising pan. Season well with salt and pepper, and sauté for a few minutes until the wedges are just starting to color around the edges. Add a splash of white wine and let it cook off. Then add a glassful of water and cover the braiser, turning down the heat to the gentlest flame. Let the vegetables braise until they are both perfectly tender, about 15 minutes or so. A few minutes before the vegetables are done, mix in the chopped parsley. Taste and, if necessary, adjust for seasoning. Drizzle with a bit more olive and serve your Artichokes and Potatoes while they are still hot. See this recipe for instructions on trimming an artichoke. There are more elaborate variations on this dish. Jeanne Caròla Francesconi has a recipe calling for sautéing the artichokes and potatoes separately until they are both nicely browned, then mixing them together to braise only briefly before serving. Personally, I like this recipe better. (One of the very few times I dissent from Ms. Francesconi’s authoritative advice.) Beside being simpler, the longer communal braise in this recipe gives the flavors of the artichokes and potatoes a chance to meld into a single, mellow whole. can frozen or canned artchokes be used. Frozen, absolutely! Just allow them to defrost and use them as you would trimmed and cut up artichokes, perhaps cooking them a bit less as they are usually already semi-cooked. I would stay away from canned artichokes, however, as they are packed in brine so have a different taste. Great food blog! We have cooking schools in Tuscany and we invite food bloggers to place posts on our http://www.tuscookany.com/blog/ page. Salute e Buon Appetito The Tuscookany Team ! My mother in law often makes this as a side dish, and she says exactly what you wrote: that the potatoes turn into the poor man’s artichoke by absorbing all that flavor. Yes, autumn is artichoke season here. Not a lot of farmers grow them because of our short growing season – but they are in the Farmers Market now. I picked up a few and usually steam and eat. This is a lovely recipe and who cares about looks. Pretty is as pretty does. I have made a version of this for years. It is always a hit. What a beautiful dish any time of year… bravo. per me sarebbe un ottimo piatto unico ! I wouldn’t call it ugly at all – it looks appetizing to me. I didn’t realize fall was also artichoke season. I need to make this dish. Sounds like a plan, Linda! Do let us know how you like it.